One of the things I've always liked about breastfeeding is the fact that it's a sustainable resource. There's no waste involved. Greg and I are avid recyclers and both of us are always looking for ways to use up less resources, or to make more use of what we've already got. It's a slow process, but we're working on it. The latest project in that regard is rain barrels. Greg ran across a post on Craig's List earlier this year from a company on the south side of the city that was selling 55 gallon plastic drums for a couple bucks each. They were food grade and the company wanted to get rid of them without throwing them away. So Greg went down and picked two up. His plan was to turn one into a composter and to turn the other into a rain barrel. It took him an afternoon and about $10 in parts, but he got the rain barrel up and running. The entire thing sits up on two concrete blocks so that gravity does the work to get the water out. You can see in the picture over there on the left that you simply turn the spout and the water comes out. Originally, Greg had planned to use the barrel to water our garden (which you can see in the background) but it turns out the two blocks aren't quite high enough to get some good gravity going. In other words, it was slow going with the water in the hose. For now, we're simply filling up a watering can and doing it that way. In Greg's master plan, he'll find a way to raise the barrel to increase the water pressure and then he'll build a drip irrigation system for the garden. Now here's the amazing thing about the rain barrel. It's set at the back corner of our one car garage. From that small patch of roof, it takes just a half an inch of rain to fill the ENTIRE 55 gallon barrel. Impressive, eh? The scary part is that we can drain the barrel in 2-3 days just from watering our small garden. Gives a bit of perspective about how much water we use. We've got 3-4 more spots in the backyard where we could place rain barrels. As soon as we get a free weekend, I think he plans to build a few more. 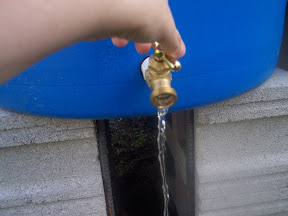 We may have to carry the water a bit further, but if we had four or five rain barrels, I think we could do most of our garden watering without using the hose. If you guys are interested, I'll have him take step by step photos when he builds the next one and I can post a tutorial on here. It really wasn't difficult at all. They're also super lightweight when they are empty, so come winter, we'll drain them, rinse them out and flip them upside down. Have you read Animal, Vegetable, Miracle by Barbara Kingsolver? You would love it. It's all about local eating and sustainable agriculture. That is such a great idea! We are all about sustainability, and I'm surprised my husband hasn't put this into action yet. I'm e-mailing him this post! yes, please ask him to post the pics and instructions! What a great plan! 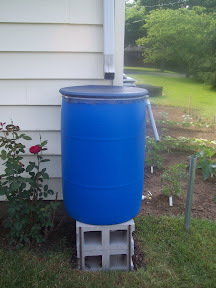 I'd love to see a tutorial about how to make the rain barrels. We'd make some and I know a couple of our neighbors who would probably be interested too! Cool! we want to do this as well. i heard from another avid gardener friend that the water shouldn't be used on edible plants. something about the shingles having inappropriate stuff in it for consumption - especially if the roof has a petroleum base to it, not to mention the bird feces that might leach into the water off of the roof. have you heard something else because i'd love to hear it please! Actually, we always used chicken poop as manuer when I was growing up, so I can't see why the bird feces (a.k.a. manuer) would be a problem? I'll have to ask Greg about the roof chemicals though. He's super careful about what he treats our garden with, so I imagine he's checked on this. All the more reason to put on a metal roof when we get ready to replace this one though. That is pretty cool! I will have to send my hubby over here - he works as a landscape architect in the middle of the Arizona desert and because of that, he is always looking for ways to reuse the rain water, the water from washing the clothes, etc, to use in the garden. A lot of people out here have this type of setup, but I don't know if they are quite as functional with the spigot and all. Very cool indeed!! Good luck. Our housing association deemed our rain barrel as "trash and debris" and tried to make us take it down. I told them it was a water conservation effort...they didn't care. I then told them to put a lien on my house and shut the door in their face. Anytime you do anything to step away from the sheep herd, they try to put you back in line. Ahh...the benefits of living in a 40 year old house in a tiny town with no "housing assocation." I was also wondering about the housing association thing. I think if we found plastic that was close to the color of the siding on our house we could sneak one on the back corner of our house. I don't think our association has much power though. It's not exactly sustainable, but I do use the water from our dehumidifier in our basement to water my containers outside. Saves about a gallon and a half of water a day anyway. That's a great idea. We just moved into a new house and we have lots of landscaping here. Just the thought of trying to take care of it is overwhelming right now, but I'm tucking this idea in the back of my head until next spring. An important safety tip that popped into my head when I read this. Know what used to be in your 55 gallon drum. My dad has lots of 55 gallon drums, but they all had water treatment chemicals in them - NOT what you want to use for this! Just make sure you know where you're getting your containers from. Oh, good point on the what they used to be filled with. I would love to see the pictures and instructions!